Yoga is a complete system for strength, health, expansion and total wellbeing. It is so much more than physical postures and Yoga that is shared from an authentic, classical living tradition brings the practitioner into deeper balance and knowledge about themselves, their life, and others. Stepping into Yoga Lifestyle and Teacher Training is an excellent way to access yogic skills, knowledge while accessing your own true strength and potential. Within the framework of Kriya Tantra Yoga, we offer a holistic traditional approach to learning how to harness and transmit yoga that guides you through the fundamentals as well as some deeper and more subtle aspects within yoga spectrum. Our Yoga Teacher and Lifestyle Training integrates, body, breath, mind and the refined energetic systems within the being to provide an integrated and holistic approach to sharing Yoga in classes and workshops as well within a yogic approach to life. This training is experience based with a clear structure that enables you to grow in expertise, competency and confidence to go on and teach yoga to others as well as to enhance the depth and power of your own personal practice. This training system was developed by Swami Shantimurti Saraswati of Ashram Yoga New Zealand and is the same system through which Swami Premajyoti received her early yoga training. It follows classical yoga traditions passed down from teacher to student over many generations, yet it is still approachable, scientific and broadly applicable in these modern times. The style of yoga we work with in the course falls within Hatha Yoga. Hatha Yoga involves physical postures (asanas), breathing techniques (pranayama) and the direction of energy through the breath to bring strength and balance to the human system as a whole. Hatha Yoga is a powerful tool for self-transformation. It asks us to bring our attention to the breath, which helps us to still the fluctuations of the mind and be more present in the unfolding of each moment. In this training, we emphasize breath awareness while performing yoga postures as this has a profound impact on all levels of your being. It is this emphasis on the breath that differentiates our approach from many other styles. This style of yoga is suitable and adaptable to everyone: beginners, advanced yogis, seniors, pregnant women and those with injuries. What we teach is well-rounded and very practical. Swami Premajyoti Saraswati has been an educator for over 20 years. She taught throughout all age groups of the schooling system and followed this up with a Masters Degree in Couneling Psychology. She went on to work as a counseling therapist for a number of years before discovering the beauty and transformative healing power of Yoga. In the area of Yoga, she is a registered 500hrs Experienced Yoga Instructor and a registered Ongoing Education Provider with the International Yoga Alliance. 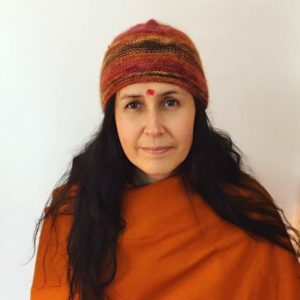 She is also a practicing Yoga Therapist and has been fully immersed in sharing the yogic arts for over a decade, including teaching advanced meditation courses and leading Pilgrimages to sacred sites in India. As a trainer, Swami Premajyoti’s teaching style employs good structure that allows room to ‘play’ with ideas and techniques while still scaffolding the learning experience to build a high levels of knowledge and confidence. Course material is presented in workbooks for you to keep and make notes in. Extra text books are beneficial but not compulsory and a suggested reading list and purchase links will be made available upon course registration. We include homework assignments to keep your learning flowing each month with written feedback given in response to work on. There are no pass/fail exams. Upon completion of the course you will be eligible to register as a Yoga Teacher with the International Yoga Alliance. Asanas: Yoga postures – moving, holding and corrective for the various bodily systems, e.g. digestive, hormonal, reproductive, etc. Pranayama: Yogic breathing techniques to both energize and balance. Anatomy and Physiology: Structure and function of the main physical body systems, as well as the energy systems of the subtle body. The anatomy of knees, hips, shoulder girdle and alignment for safety in yoga classes. Yoga Therapy: Elementary therapeutic yoga for back problems, migraines, breathing needs, etc. Be able to design classes for both groups and individuals that suit their ability and overall needs, including postures (asana), yogic breathing (pranayama), relaxation and meditation. Understand how the yoga you deliver impacts the human system on a physical, energetic and mind level and apply this to the combinations of techniques you choose to suit people from all walks of life. Support people of different needs, body type and awareness within your class structures. Structure and deliver classes that have an energetic map and know how to use such structure for different impacts within a class. Gain a deeper understanding of your own body, energy and mind and how to work with yoga to optimize your health and vitality. Be able to explain the basic elements of yoga practice to class participants and know why particular things are included in yoga classes. Develop an understanding of the basic philosophies that underpin Yoga and what is generally considered ‘Yogic Lifestyle’. Formulate group and individual classes for differing levels of ability and needs including utilising yoga postures (asanas), breathing techniques (pranayama), relaxation and simple meditation techniques. 8:00 am – 6:30pm general instruction. A simple healthy vegetarian lunch is provided each full day of training. Tea and filtered water are also available. There will be breaks over the course of each day, so participants are welcome to bring snacks to stay fueled. Immersion in and experience of yogic environment during training.